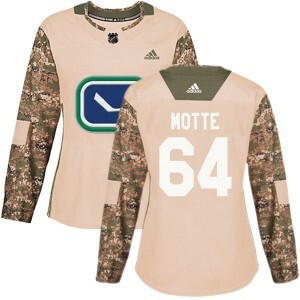 Represent your loyalty to your favorite Canucks player with Tyler Motte merchandise. On top of the hoodies, tees, and even jackets worn at the game, most fans sport their player's official replica jersey as a mark of their dedication to the team. 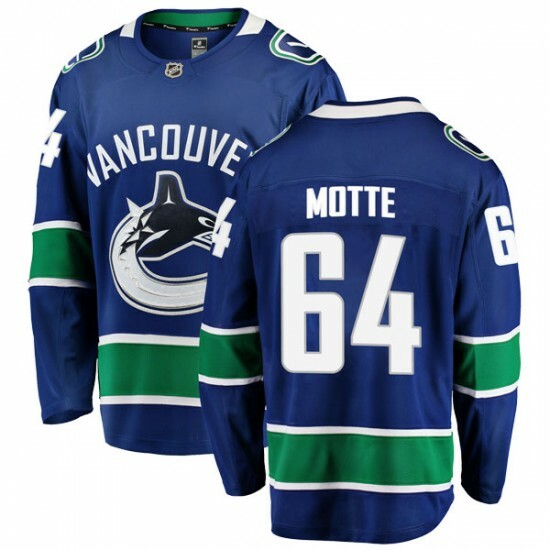 For fans of Tyler Motte, we have a vast selection of styles and sizes that will add a bit of variety to the arena during each game. Adult and youth styles are available in the team's color jerseys, but we also offer alternate jerseys for those fans that want something a bit more unconventional at each game. Tyler Motte Jersey There are 15 products. 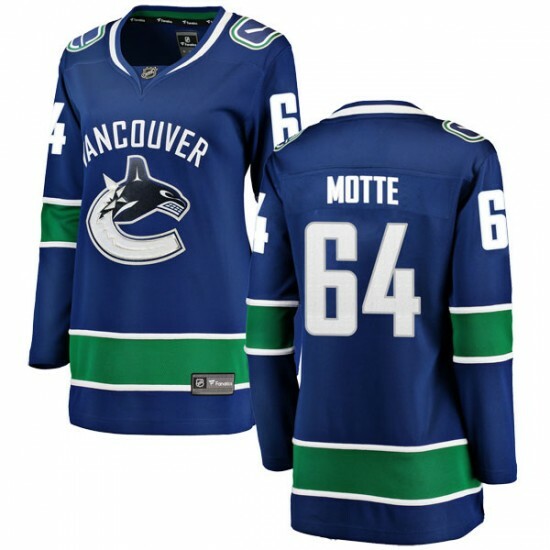 Show them you are the #1 Vancouver Canucks fan when you wear this Men's Vancouver Canucks Tyler Motte Fanatics Branded Breakaway Home Jersey - Blue! Featuring Vancouver Canucks graphics, this jersey will keep you comfortable and full of team spirit. It is a must-have for fans of any age! 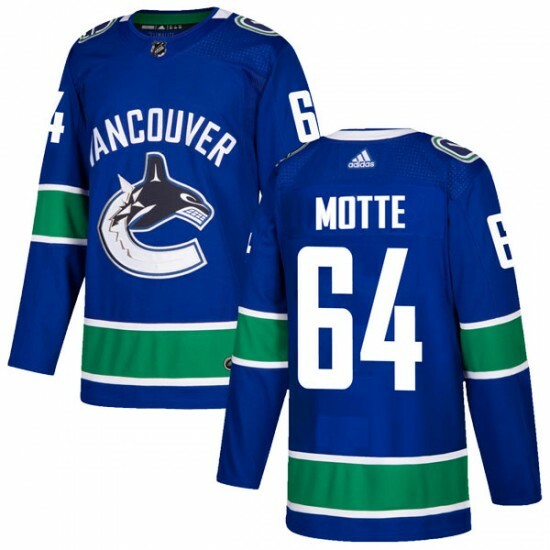 Show them you are the #1 Vancouver Canucks fan when you wear this Youth Vancouver Canucks Tyler Motte Fanatics Branded Breakaway Home Jersey - Blue! Featuring Vancouver Canucks graphics, this jersey will keep you comfortable and full of team spirit. It is a must-have for fans of any age! 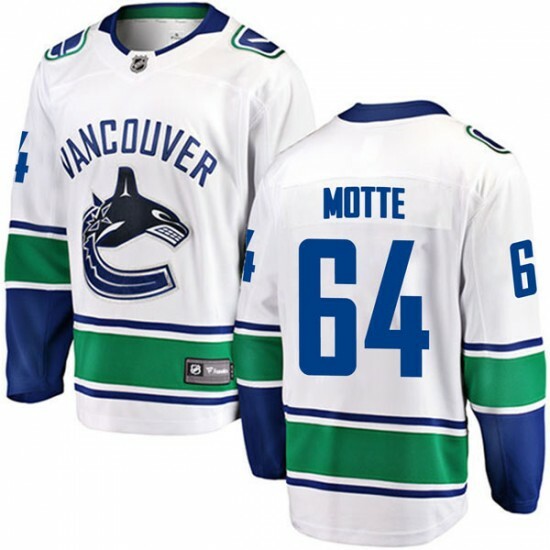 Show them you are the #1 Vancouver Canucks fan when you wear this Men's Vancouver Canucks Tyler Motte Fanatics Branded Breakaway Away Jersey - White! Featuring Vancouver Canucks graphics, this jersey will keep you comfortable and full of team spirit. It is a must-have for fans of any age! 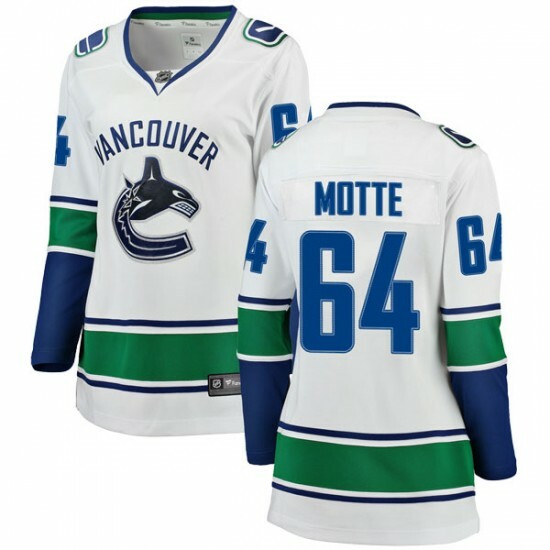 Show them you are the #1 Vancouver Canucks fan when you wear this Youth Vancouver Canucks Tyler Motte Fanatics Branded Breakaway Away Jersey - White! Featuring Vancouver Canucks graphics, this jersey will keep you comfortable and full of team spirit. It is a must-have for fans of any age! Prove you are the #1 Vancouver Canucks fan with this Men's Vancouver Canucks Tyler Motte Adidas Authentic Home Jersey - Blue! This jersey is perfect for the Vancouver Canucks fan who wants a great new way to show some spirit for the Canucks. 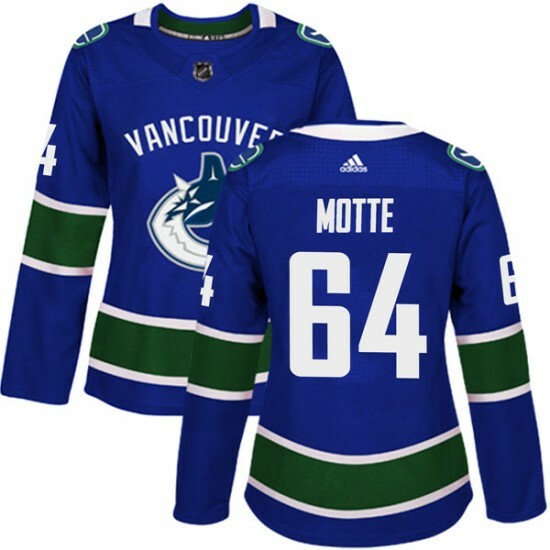 Prove you are the #1 Vancouver Canucks fan with this Youth Vancouver Canucks Tyler Motte Adidas Authentic Home Jersey - Blue! This jersey is perfect for the Vancouver Canucks fan who wants a great new way to show some spirit for the Canucks. 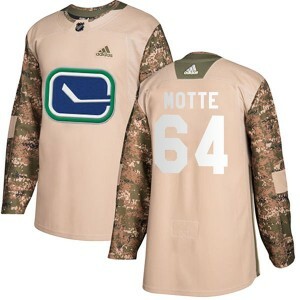 Prove you are the #1 Vancouver Canucks fan with this Men's Vancouver Canucks Tyler Motte Adidas Authentic Veterans Day Practice Jersey - Camo! This jersey is perfect for the Vancouver Canucks fan who wants a great new way to show some spirit for the Canucks. Prove you are the #1 Vancouver Canucks fan with this Youth Vancouver Canucks Tyler Motte Adidas Authentic Veterans Day Practice Jersey - Camo! This jersey is perfect for the Vancouver Canucks fan who wants a great new way to show some spirit for the Canucks. 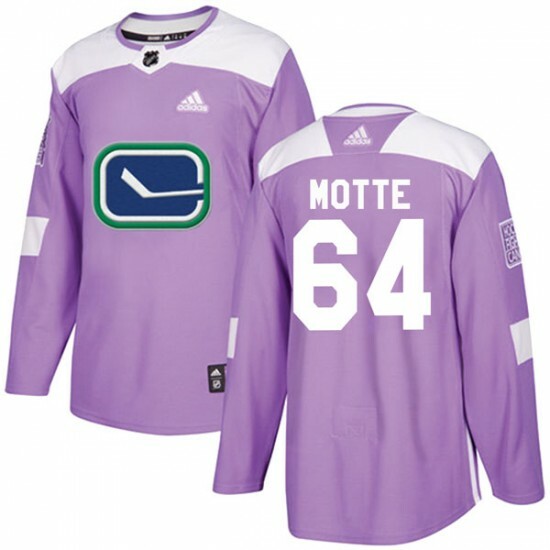 Prove you are the #1 Vancouver Canucks fan with this Men's Vancouver Canucks Tyler Motte Adidas Authentic Fights Cancer Practice Jersey - Purple! This jersey is perfect for the Vancouver Canucks fan who wants a great new way to show some spirit for the Canucks. 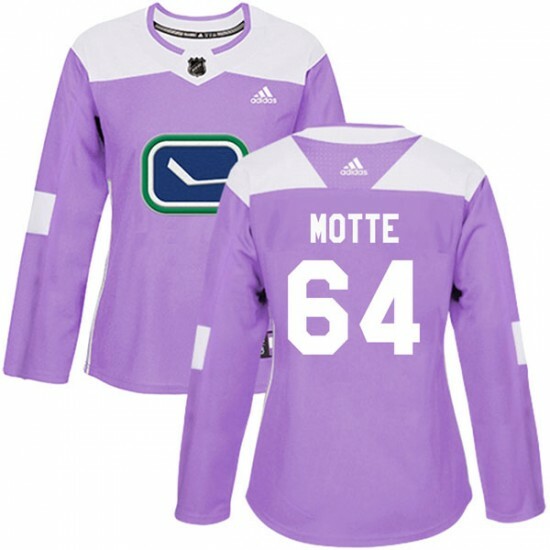 Prove you are the #1 Vancouver Canucks fan with this Youth Vancouver Canucks Tyler Motte Adidas Authentic Fights Cancer Practice Jersey - Purple! This jersey is perfect for the Vancouver Canucks fan who wants a great new way to show some spirit for the Canucks. Show them you are the #1 Vancouver Canucks fan when you wear this Women's Vancouver Canucks Tyler Motte Fanatics Branded Breakaway Home Jersey - Blue! Featuring Vancouver Canucks graphics, this jersey will keep you comfortable and full of team spirit. It is a must-have for fans of any age! 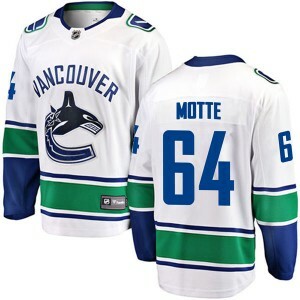 Show them you are the #1 Vancouver Canucks fan when you wear this Women's Vancouver Canucks Tyler Motte Fanatics Branded Breakaway Away Jersey - White! Featuring Vancouver Canucks graphics, this jersey will keep you comfortable and full of team spirit. It is a must-have for fans of any age! Prove you are the #1 Vancouver Canucks fan with this Women's Vancouver Canucks Tyler Motte Adidas Authentic Home Jersey - Blue! This jersey is perfect for the Vancouver Canucks fan who wants a great new way to show some spirit for the Canucks. Prove you are the #1 Vancouver Canucks fan with this Women's Vancouver Canucks Tyler Motte Adidas Authentic Veterans Day Practice Jersey - Camo! This jersey is perfect for the Vancouver Canucks fan who wants a great new way to show some spirit for the Canucks. Prove you are the #1 Vancouver Canucks fan with this Women's Vancouver Canucks Tyler Motte Adidas Authentic Fights Cancer Practice Jersey - Purple! This jersey is perfect for the Vancouver Canucks fan who wants a great new way to show some spirit for the Canucks.